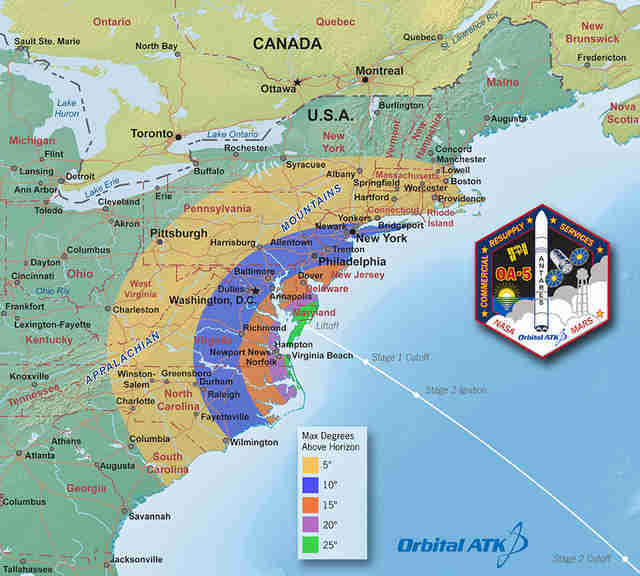 If you live on the East Coast and have a good view of the horizon, there's a good chance you'll be able to catch a glimpse of a major rocket launch early Monday night. Best of all, you won't need to go anywhere near Florida in order to see it. 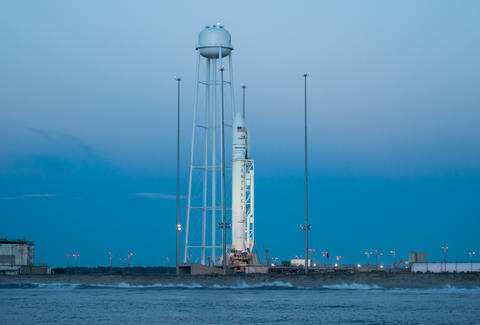 After a faulty cable glitch caused a 24-hour delay on Sunday, Orbital ATK's Antares rocket is currently scheduled to blast off from NASA's Wallops Flight Facility in Virginia at 7:40pm EST on Monday for a resupply mission to the International Space Station. Sure, delivering supplies to the ISS probably doesn't mean much to you, but witnessing a badass rocket launch could be pretty cool, right? 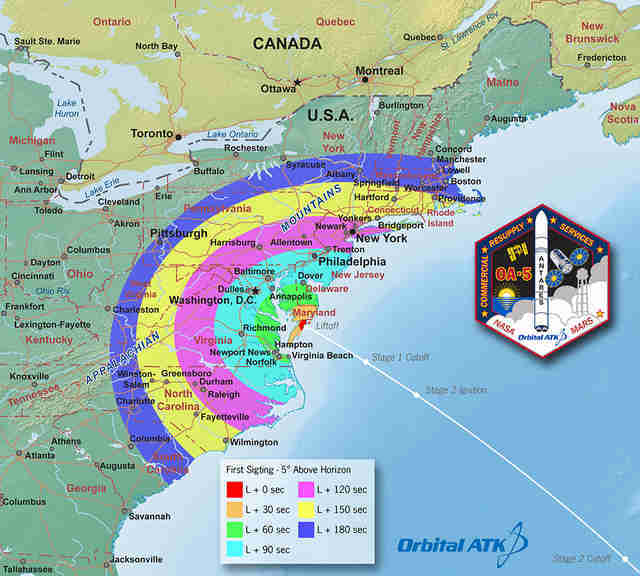 Well, according to NASA, millions of people along the East Coast will actually be able to see the rocket blaze through the sky tonight, especially if the clear weather holds. You'll have to look to the right place in the sky at the right time, though. Thankfully, ATK and NASA have provided helpful maps showing exactly where and when you'll need to look in order to get a glimpse of the rocket. As a local CBS News station explains, you'll likely need a view of the horizon that's unobstructed by trees and buildings. Or, better yet, a clear view of the horizon from at least a few floors above the ground. This is all to say that now would be a great time to set an alarm for 7:35pm EST so you can drop everything you're doing to run out to your backyard to see if you can spot Antares shooting towards the heavens. Sure as hell beats your typical Monday night plans. Oh, and if you don't live in the aforementioned viewing area or likely won't have a good view due to local weather or other conditions, NASA is also providing a live stream of the launch on NASA TV, so be sure to tune in before 7:40pm to watch it all go down. Or, in this case, up. Way up. Tony Merevick is Cities News Editor at Thrillist and would have been really excited about this as a kid. Send news tips to news@thrillist.com and follow him on Twitter @tonymerevick.